GreenDan.org: No Recycling on Chicago Beaches? 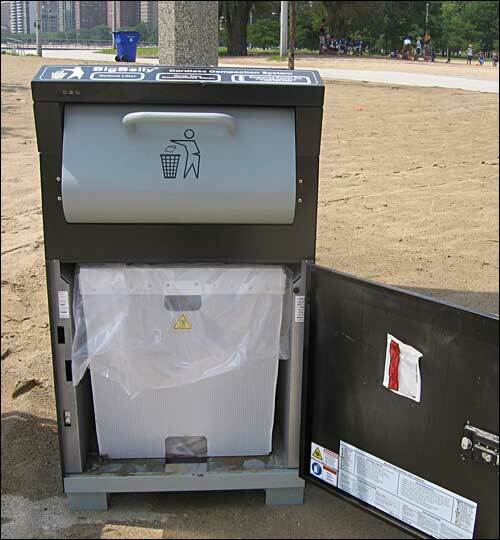 No Recycling on Chicago Beaches? Regarding Tuesday's story on All Things Considered about "Big Bellies" in Chicago ("Solar Compactors Make Mincemeat of Trash"), I'm left wondering, what about recycling? Sure, solar-power is great and keeping Chicago's beaches clean is a laudable goal, but doesn't this program effectively eliminate recycling? Each compactor holds "200 gallons of regular garbage." Once this trash is compacted, I suspect that it's difficult, if not practically impossible, to extract the cans, glass and paper that could have been recycled. And how much of typical beach waste is recyclable? 50%? 75%? Close to 100%? And these compactors aren't cheap at $4,000 a piece. Wouldn't it be less expensive and more environmentally responsible to simply teach Chicago residents how to recycle instead? Actually, compaction does not impede recycling. Palm Springs, CA is one community that separates recyclables out of the trash after collection, and they have had equal success with BigBelly compactors. The machines don't make a brick or bale, they just squeeze out the air, making collection more efficient (save 4 out of 5 trips, which adds up to a lot of avoided diesel fuel burning and exhaust emissions). Those avoided collections also provide an ROI, so the compactors pay for themselves. Recycling is important, whether you collect separately or separate out after the fact, and compacting receptacles only help make the process more cost-effective. I would be interested in learning more about Palm Springs' separation of recyclables out of trash, since they appear to have separate containers for residential pickup. What can you tell me about this, as well as their use of BigBelly compactors? Another issue with trash compaction is mentioned in an article on treehugger.com. Compacted trash is great if you're looking to fit the maximum amount of waste into collection trucks, or landfills. But the flipside of that benefit is that now your landfills get no oxygen, since they're so perfectly compacted. And without oxygen, you don't get decomposition. You get preservation. So landfills end up being giant storage heaps for trash. Today I spoke with the Recycling Manager for Palm Springs, CA, who told me that they do not "separate recyclables out of the trash after collection" -- that's why they provide containers for customers to sort out their own recyclables. Their waste is trucked to a Materials Recovery Facility (MRF) in Riverside. Is that what you were referring to? Btw, Palm Springs hopes to have its own MRF in two years. As for their "success with BigBelly compactors," they stopped supplying compactors for their customers, and the Recycling Manager doesn't know of any business in Palm Springs that now uses a Big Belly trashbin, or has in the past.